The Fujitsu-6125LA’s ability to scan up to 30 ppm or 60 ipm in monochrome / greyscale (Letter, 200 dpi) makes it the top cost performer in its class. Its ability to continuously scan 50 page mixed batch documents containing paper of different weight, quality and sizes enables the Fujitsu-6125LA to efficiently digitize large volumes of paper documents. The Fujitsu-6125LA is also able to scan up to 3 non-embossed plastic cards or 1 embossed plastic card (up to 1.4 mm thick) at a time. The fujitsu-6125LA is loaded with high-end fi-Series functions that enable it to efficiently scan mixed batch documents containing paper of different weights, quality and size. Ultra-sonic double feed detection is the most advanced method for detecting double feeds. 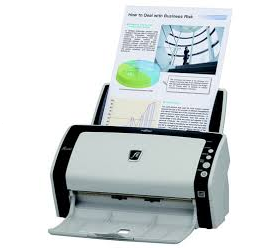 It works reliably even when scanning pages of different sizes, thicknesses and colours.